My first taste of chocolate was unhealthily early. Mom left my dad in charge of me while she was out for a while. When she came home, she freaked out because there were brown smudges all around my mouth. Thinking I was hurt, she confronted my father. At least, this is how I was told the conversation went. Thus began my very early love of chocolate. 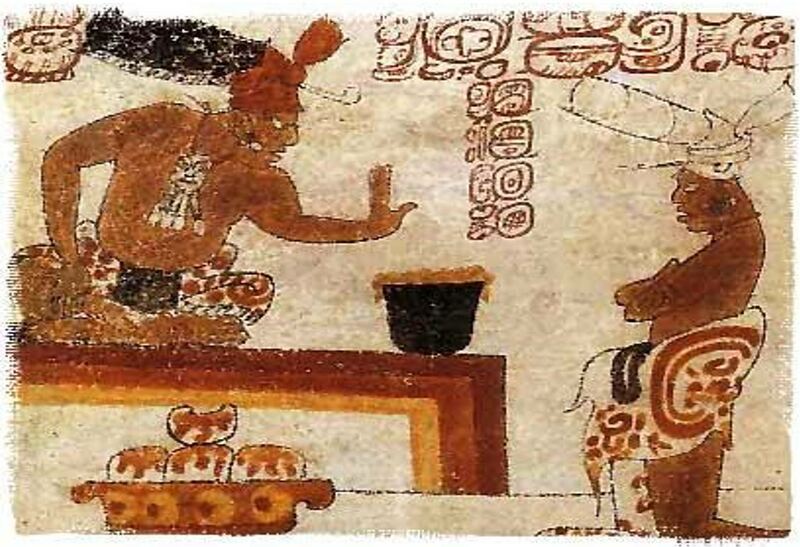 The Mayans honored a cocoa god. Eating and drinking chocolate was confined to the ruling classes, for sacred ceremonies. 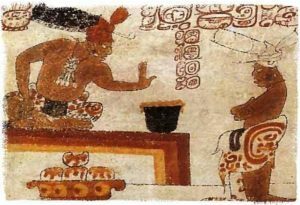 The Aztecs used cocoa beans as a form of currency, consumable for the privileged. Montezuma, a 16th century Aztec emperor, drank three gallons of chocolate a day to increase his virility. Enter the Spanish conquistadors, who brought home chocolate after their search for precious metals in Mexico. 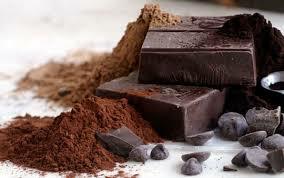 The Spaniards kept chocolate a secret until a Spanish princess wed a French king. She brought her love of chocolate to her new home. Chocolate’s popularity spread quickly through Europe. European powers established plantations in Mesoamerica, depleted the labor pool with European diseases, and imported African slaves to work the plantations. 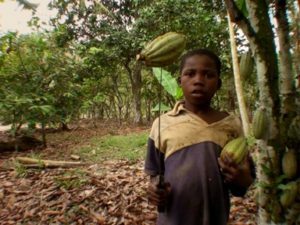 After eating countless pounds of chocolate, and sharing it in baked goods and candy with family and friends, I discovered that child slaves were being used in the making of chocolate. I felt sick. The industry is working on its agreement to reduce child labor in the Ivory Coast and Ghana by 70% by 2020. I hope they follow through. This deadline has already been pushed back several times. In the meantime, I vote with my wallet, purchasing ethically produced chocolate. Chocolate. What is it good for? The health benefits of chocolate are many, particularly dark chocolate. According to Rashed Latif’s article in the Netherlands Journal of Medicine, “chocolate has tremendous antioxidant potential.” This may have a positive effect in aging, oxidative stress, blood pressure regulation, and atherosclerosis. Chocolate may lower cholesterol, prevent memory decline by improving blood flow, and lower the risk of heart disease–all terrific health benefits. Chocolate might make us smarter. Caution here. This is a small amount of chocolate, preferably dark. Too much sugar, which is highly addictive, causes cavities and a long list of health problems. Moderation is important, albeit not as much fun as indulging in big bar of chocolatey goodness. Tagged chocolate, health benefits, slavery. Hm… I had no idea about the use of slave labor in chocolate production. Is there a way we can identify what brands or varieties of chocolate are NOT produced with child laborers and slaves? This website, http://www.slavefreechocolate.org/ethical-chocolate-companies, gives a list of ethical chocolate companies and shows what kind of stamps to look for on the candy packaging. Ellen, I had no idea. How do I follow suit, and buy only from ethical chocolate suppliers? When I first heard about the abuse of children in the making of chocolate I was shocked. Here I’ve been contributing to this for years unknowingly. I have a special dislike for Nestle for this as well as the major issue of water. Another website, http://www.slavefreechocolate.org/ethical-chocolate-companies, gives a list of ethical chocolate companies and shows what kind of stamps to look for on the candy packaging. Great piece! I remember when I was very young,Chocolate was received by my family. It came in form of dark blocks, as a child country of origin was not my concern. Sparingly offered a drink was prepared with raw milk. The concoction had no filler, no additives. Ellen points that the sweets and the drinks we now consume are poor remnants of what chocolate once was. A variety of companies now produce something not really fit for consumption but only for profit. I’m glad you enjoyed the piece, Eveline. I am deeply troubled by those who are willing to cause such damage to human beings in the name of the company bottom line. In case you are interested here are some informative sites: http://www.slavefreechocolate.org/ and http://www.slavefreechocolate.org/ethical-chocolate-companies, which gives a list of ethical chocolate companies and shows what kind of stamps to look for on the candy packaging.